Now that’s imagination at work! 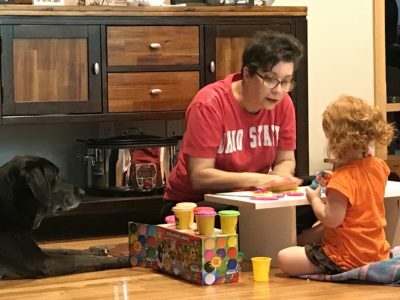 My two-and-a-half-year-old granddaughter is my latest make-believe pal. We play “tea time” with measuring cups when she’s in the tub, and I use my best British voice to entertain her. There’s also a “house” my husband repurposed from a box one of his woodworking machines came in. (No, Mr. Campisi, you’re not buying another machine, so you can re-use the box!) He cut out windows, a door, and taped photos of family and friends inside the house. I’ve thought of adding drapes to the windows from fabric remnants, and decorating the outside of the house. Who needs a fancy playhouse when you’ve got cardboard and your imagination?